I was testing to see whether Google+ Pages create annotations in Google's search results. The screen grab I'm including in this blog post starts with a geeky blog entry I wrote about a cake that looks like a NES. You can see my author markup all around it. Below that you can see that Geek Native shared the post. That annotation shows up despite the fact that the post comes from the blog associated with the Google+ Page in the first place. You could argue the annotation is redundant. Does this mean that just having a G+P can positively impact your clickthrough rates? That's not the reason for this blog post, though. There's still plenty of testing to do with G+Ps. The reason for this blog post is the presence and position of the PPC ads. There are three of them for this SERP. None of the PPC ads appear at the top of the page. None of the PPC ads appear at the side of the page. All of the PPC ads for this search appear at the bottom of the page. Wow. Isn't this a very different Google? What's the logic here? 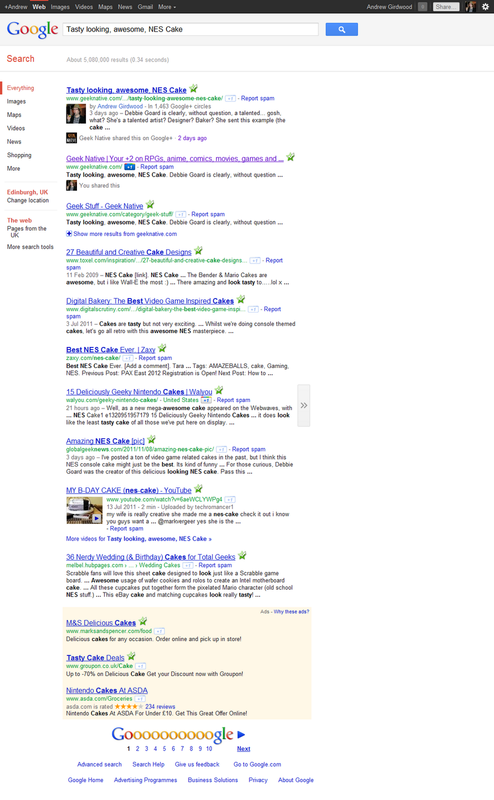 None of these ads are good enough to show on the side but Google will squeeze them in at the bottom of the page anyway? Are their bidding software out there who think they've got ads in positions #1, #2 and #3? They're in for a shock.